[NOTE] This article articulates the evolution of complexity from the void due to the introduction of difference into the unchanging void, or the pure awareness of creation. The “difference” can be understood as consciousness expressing awareness of being in the void. Introducing a novel mathematical form, the SCIET, an acronym for Single Cycle Integrative Effect Topology, to explain how this expression of awareness affected the otherwise changeless void is the basis of the SCIET Functional Cosmology. SCIET Theory explains the consequences of the initial change in terms of rules affecting how the existence of polarity is distributed within a defined space. In this model the change becomes ever smaller and faster, eventually redefining itself in new sets until it reaches the limits of its origin, just as a pencil may be able define change on a massive piece of paper, but can no longer define it when the change is smaller than the tip of the pencil. Conceptually this can be overcome by beginning again with a new sheet of paper and continuing the definition of change. However, the change is not only by the size of the paper, but by the nature of the paper, in the case the originating consciousness that emerged into the unchanging awareness as a singular identity. The “Stages of Creation” presentation has three stages before the “big bang” Culmination event, and discusses three after it, including the next stages beyond where we are today. Each stage exists as a consequence of the prior stages. The SCIET Universe is created by the Awareness defining the Creation Substance as a limited space and then expressing a Unitary Value to that edge from its center that began to descend. magnitude by magnitude until it reached the value of the Creation Substance where it Culminated into the third Unitary Value and began the Stage of Agreement . The SCIET Functional Cosmology is used to teach the concepts of SCIET Dynamics by introducing them in the context of their manifestation in nature with a brief explanation of why the concept is needed and how it contributes to the creation. The Creation is an evolutionary platform and the Cosmology is the natural way to understand its complex progression. Earlier versions of this web site have relied on the use of applications, examples of how SCIET Dynamics explains everyday activities, to convey the foundation ideas. The Cosmology provides a platform for comprehension while the Applications enable recognition from experience. Spacimetrics addresses the ability to calculate SCIET Resonance Maps as a third platform for understanding SCIET Dynamics. Teaching and learning where we have come from and how things work while developing practical economic, social and spiritual benefits is the three part approach on this site. Understanding the conditions before matter formed has necessitated the development of a consistent approach to the Harmonic Receptive Reduction algorithm of SCIET Dynamics. Backward chaining the ideas of the SCIET to before the first action leads to the idea of SCIET Frequency Potential Levels as the basis for Awareness and the Creation Substance with Limitation thus enabling individuation, resonance and the beginning of Relationship setting the stage for Culmination and the formation of matter. Awareness is the highest frequency potential. It is so fast that it is unlimited and thus needs the limitations of the slower Creation Substance to project intention into. It is an order of magnitude faster and smaller than the Creation Substance. Awareness is unlimited, its receptive frequency potential is unlimited, so the role of the creation substance is to enable the creation of limitation and consequently, resonance within the creation substance. The Limitless Nature of the Awareness is the highest frequency potential in the universe. It is so fast that it is unlimited and thus needs the limitations of the slower Creation Substance to project intention into. It is an order of manitude faster and smaller than the Creation Substance. Awareness is unlimited, its receptive frequency potential is unlimited, so the role of the Creation Substance is to enable the creation of Limitation and consequently, resonance within the creation substance. Unity is achieved through movement toward the void, taking place in a series of increments that, although ever smaller, are still manifest. These infinitesimal increments make it possible to diffuse all incoming information throughout the universe at unitary values appearing to be faster than “light”. These values (the infinitesimal substrate) are present when the Primary Value of any SCIET is established, or emerges from the Void. All cycles are synchronous to the Universe. For every value or cycle there is a Universal Pulse, meaning that everywhere in the universe that the value exists, it is entering Unity at the same time. The Pulse is universal and every value is occurring in harmony with it. They are all entering Unity or Universal stasis at once. Thus change from throughout the Universe is joined into a single thought or energy state at the end of each Pulse and each new cycle emerges from Unity into a state of Universal Harmony. Since each cycle terminates into the Infinitesimal Substrate, it harmonizes with all the other cycles occurring during the same Pulse.The Pulse is very important to understanding the twelve angularities of the SCIET. Each angularityexists in the context of larger systems that share that angularity. During the pulse into Unity all the systems that go into unity at that moment harmonize or share information/energy. Sharing not only the moment but also the angular polarity makes the Unity more powerful. This is the source of the similarity between the astrological houses and signs which are references to each persons and the solar system’s angularities. The Yin Yang symbol of the ancient Chinese provides insight regarding the nature of the pulse. The fullness of each phase is seen to be of equal duration and intensity in the symbol, but understanding the simultaneous nature of many cycles and the fact that they are all able to maintain their own Pulse makes the Yin Yang clarity hard to achieve in practice. Like the Platonic Solids it is a teaching tool with a pure truth underlying it. This idea is most easily understood through Set Theory. Each value is part of a set and the set is universal, existing everywhere as a potential to enter the unity simultaneously. During the transition into the void the set functions as a unit to dissipate the accumulated information/energy from each individual cycle. Origination from the Infinitesimal Substrate occurs on a foundation of the fusion in the Infinitesimal Substrate. Thus a Universal Pulse distributes the intrinsic knowledge of the universe to each new cycle or SCIET. The Pulse is the basis for the Unity Principle. The key to doing this is the SCIET, a kind of mathematical atom. It defines a process within a specific space that begins with an act of awareness, the recognition that there is another place or point in space. The simple act of awareness is the beginning of the universe. Using the SCIET we can build a model of change that replicates creation. The act of awareness can be described by a line drawn between two points, followed by a series of other lines based on the first one, each originating from the same point until all the space surrounding that point is defined by the first line and its parts. The lines between the lines are also based on the original base line or SCIET Line. All points in space do this. All that is required is for them to be defined through relationship to something else that exists. The first stage of creation defines all the space relative to a central point, followed by all defined points reacting to each other in a continuous reaction of creation.Each cycle begins by defining a new value that is subdevided into the space surrounding the center and as it subdivides into equal parts does so in a manner that allows each point to maintain its own identity, to have a unique but harmonic part in the whole at all times. Another way to look at it is to imagine that the smallest center point of the SCIET is a pixel, in which case the computer display would need to be 1214 feet by 1214 feet square. This is a SCIET Magnitude. Subdivision in space is a primary assumption in SCIET Dynamics. The tetrons each defining a distance from the center in two ways, the edge and center. The Capacitance Lattice originates with the SCIET Orbital Return from all the matter in direct line-of-sight. SCIET Spheres are the result of the orbital return, with the smallest fastest frequencies creating proton shells and the proton shells themselves providing the orbital return that creates electrons. While resonance insists upon the even subdivision of space the growth of living bodies uses the phi ratio. In SCIET Theory the Phi ratio is seen in the tetron as part of the SCIET. The angle of the SCIET center to the tetron center creates a phi relationship between the surface planes of the Icosahedral and Dodecahedral forms. Awareness in the Creation Substance leads to the recognition of other, or the creation of relationship in the creation substance. The Awareness’ magnitude higher rate of change enables it to inhabit the larger slower SCIET values of the creation substance and express intention, ordering the magnitude slower creation substance with a SCIETline of the Awareness between two locations within the Creation Substance. Removing all matter from space would leave only the creation substance without the disturbance of matter and radiation. Although modern astrophysics calls it the void, but now considers that it must be teeming with zero point energy. However, for our purposes we generalize that the qualities of the creation substance can be seen by how it expresses the properties of gravity, radiation and mind. Relationship is the underlying pattern of space established by the intention of the Awareness. The space defines itself using the SCIET Dynamic to create tracks of potential within the Creation Substance. During the Relationship Stage all the volume of affected Creation Substance is processed so that every location is addressable. In essence the intention expressed subdivides to its smallest part before achieving culmination. Modern technology has a good analogy to this situation. Computer hard drives are manufactured using a coating of magnetic particles on the surface of spinning disks which are “written” on by tiny electromagnetic needles that cover the surface with small changes to enable the read/write function. This is called formatting and it is not data, but the preparation of the media to handle data, to make it relate to itself in an organized way. Since Awareness permeates the volume of the Creation Substance, the formatting defines Integrated Awarenesses known in spirituality as the Angelic Hierarchy, with each subdivision resulting in an individuated, evolving awareness. Each level of the Hierarchy represents a level of subdivision within the Creation Substance until the Culmination when all the individuated parts begin to exchange resonance using the Combinatory Principle. As a result of this each individuated value is surrounded by Capacitance Layers related to system-wide shared values. Culmination in a system is related to the idea of Limitation in the Creation itself. The boundary or transition event of the Harmonic Fractional Receptive Reduction process that results in the transfer of all information from the Unitary Value to the Point of Magnitude A created system has a beginning and the Culmination occurs when the initial defined value subdivides to a value equal to the smallest, fastest value possible in that SCIET range. 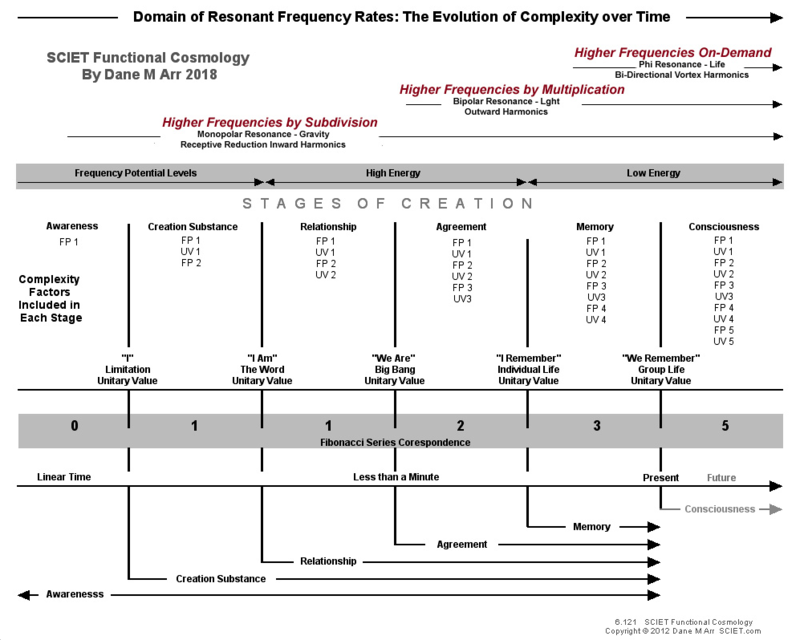 The resulting value is individuated and becomes resonant within the frequency values defined by the prior subdivisions. During the creation the Culmination resulted in the formation of protons based on the smallest and fastest resonant values, which remain in continuous resonant relationship to the present. The 7.35 Centimeter Cosmic Background Radiation is considered to be a remnant of the big bang, evidence of a Univers-wide event related to that value.. In SCIET Dynamics it is basis of the Culmination, being the value that resulted from the intersection of energy and density that began the Third SCIET and Resonance Return. Culmination occurs in all created systems and is particularly noteworthy in the nervous system where it distributes new information to all cells and governs all the transitions between value ranges. It is basis of the holographic effect when combined with Agreement and Memory. When a soap bubble bursts it immediately culminates into its receptive reduction values, with the droplets in the mist created by the burst being tiny bubbles rather than droplets of water. The culmination allowed a new range of values related to the creation of protons and electrons, which are the integration of the first three stages into a new individualized parts that work with the Awareness in the Creation Substance with Relationship. When Memory is fully evolved it combines with Agreement or natural law to form the Stage of Consciousness. The concept of the “fifth dimension” being discussed in popular culture today is rooted in this Consciousness Stage of evolutionary development. In practical terms the third dimension “Agreement or natural law” compounds with the fourth stage of memory where the material structures are the armatures for the evolving resonant memory of life into a dimension of pure consciousness. Current digital technology has a useful corollary to this. The evolution of computers began with hardware and as software was added to it, the functionality increased dramatically. The computer had a variety of components, each manufactured separately to use the digital codes of the software programs. All of these components had processing speeds built in to them, and combining components required that all could match the speed of the central processor, since the system could not go any faster than its slowest part. Each of the parts was just a tool for handling the software coding, it would recieve the code, do its thing and deliver it to the next component. As processors became faster and more stable, it became possible to use them for solid state memory, long used for cacheing the programs results, the Random Access Memory became faster and cheaper until networks began to use them to store frequently used files instead of hard drives. The Internet developed services that maintained racks of cacheing computers just so people could download files quicklym since they could avoid the mechanical action of the spinning disks and their complex sectoring of data. The success of these systems led to the next generation of services using even faster RAM, the virtual server. Now it is possible to have all of your website’s data, programs and content entirely within a virtual space. No longer are components required, no more hardware is required because the RAM can recreate the entire system as software in a virtual space. This advance has had enormous benefits to the entire environment of computing, now entire websites can be duplicated and installed on other ram installations around the world, making capacity issues a thing of the past. Now compare this to the evolved life forms of the third dimension. The code or program needed for life is attached to a strand of DNA. That strand has the information needed to build the hardware to run the program. It is like a automated factory about how to use readily available components to build the computer needed to run the main program, its real purpose for existing. While it is not widely known to the population, the frequency of the planet in the third dimension is like the slow processing speeds of hardware computers. In order to run the program, hardware is required. As the processing speed of the space that the planet is in increases, it becomes possible for the program to run without hardware, the space itself becomes the RAM needed to run the living systems that now depend on the use of assemblies of molecules, the hardware of life. The astral body has long been known as a way to exist in space outside of the flesh and bones body, but it requires a frequency feed, (the silver cord) from the body to maintain itself in the space of the planet. Life has always created its own high frequencies. What is currently known as ORMUS, White Powder of Gold, Manna, Shew Bread, the Philosophers Stone and more recently as Tachyons, have all depended on the character of a few elements to become superconductive be being physically deformed to cause the end valances to connect, which causes them to square the frequency potential. This very high frequency is the basis of the living body’s ability to communicate and store information throughout its frequency field, which is related to the frequency at the center of the DNA molecule. All life utilizes this to communicate. The planet is now entering a stage wherein the resident frequencies are about to go virtual for the existence of life. The change is not just about raising our existing frequency, but about an exponential increase in the ability of the space to hold information. There is talk of a “Solar Flash” happening that will “change everything”, and this is about to happen according to those who have devoted their lives to learning about it. In the explanation here about Energetic Astrology, this is covered as a new causal frequency, which is the base frequency of the space that our solar system exists within. In this way of understanding our world, we can realize that this will make our entire reality go “virtual” and the ability to program space will be natural and universal. It also will mean that those with erroneous ideas about how things work will experience meltdowns, as their programming creates fatal conflicts within the interactive network. It will no longer be possible to isolate failed ideas or ways of thinking, it would be like trying to run an Apple II on a virtual system, the content and components are incompatible.